Jean said: "Cambridge is particularly good for bookshops - these are the 3 that I use most often: Galloway and Porter, Amnesty International Bookshop, Oxfam Bookshop. 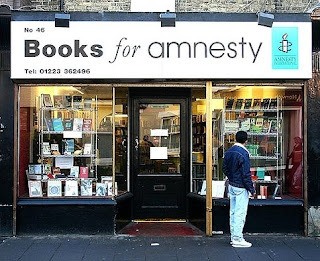 Amnesty International - one of several largely second hand bookshops run by this human rights organisation, so, it is particularly strong on human rights, social justice etc. Mill Rd in Cambridge is a vibrant street, popular with students and international visitors, with lots of charity shops (Salvation Army sells clothing from British Antarctic Survey, furniture, cutlery & crockery, for example), international food shops, bike shops etc." The next recommendation from the university town of Cambridge presents a spot which is quite different from ordinary second-hand bookshops. The famous logo depicting a candle in barbed wire is widely recognized as the symbol of one of the leading NGOs in the field of human rights - Amnesty International. 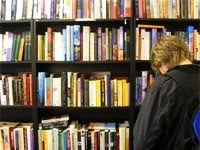 What many people especially in continental Europe don't know is that this London based international NGO also runs a small chain of second-hand bookshops to raise awareness about its activities and projects but also to raise some additional funds. We hope that you won't object to this addition to the Guide since although it's technically a chain, it only offers second-hand titles and the revenues are used for a good cause. 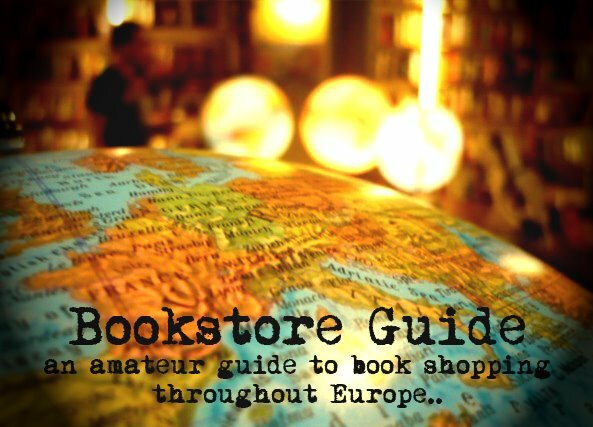 All in all, there are six bookshops in the UK and their list can be found here. The Cambridge Books for Amnesty International bookshop was opened in 1998 and its entire stock is made of second-hand books donated by people who sympathize with their cause. This also means that the stock is very eclectic and you can find all sorts of titles both in the fiction and non-fiction sections. It's also interesting to point out that the entire staff of this friendly small bookshop is formed by volunteers. I'm the new manager of Books for Amnesty on Mill Road and I wanted to say thanks very much for this lovely article. We very much appreciate the good word and the great publicity : we're very proud of our fabulous shop and our wonderful books, of such great quality, quantity and variety, that are so generously donated by supporters in and around Cambridge. I wonder if you'd be so kind as to amend the opening hours. Sometime back we settled on opening from 10am to 5.30pm Mondays to Saturdays (but are usually open the same hours on Bank Holidays). People do travel from afar to visit us and I wouldn't like to disappoint them by finding us unexpectedly closed. Dear David, corrections made. We very much appreciate the update. We've also added a map, as it seems to have been missing for some reason.